I'd knitted it off and on for most of life. I never felt any hurry to complete it; in fact, I never really knew how long I wanted it to be. Just, every so often, I'd pick it up and weave another couple of rows. Over the years, it grew longer and longer, and became stretched and unevenly discolored by the passage of time. I wore it everywhere I went. First I could wrap it around my neck a single time, then twice, keeping warmer and warmer with each passing season. It's many years later now, and I lay old and tired in my bed. I've lived a long, full life, and here I am, pushing onwards despite sickness and age. I move the scarf through my hands and look at its oldest sections, where the needlework is most frayed and the colors most faded. I think back to the days when I began knitting it—how young I was then! How careless and strong, how healthy and free! Tears well up as I picture myself then; how could they not? But those days are gone, and this cold struggle is all that remains. That story sums up what Journey meant to me. What it'll mean to you remains to be seen. But no matter what meaning it imparts, ThatGameCompany's creation is a triumph, a video game that is as remarkable for its discipline as it is for the effortless manner in which it welds its vast reserves of breathtaking beauty. 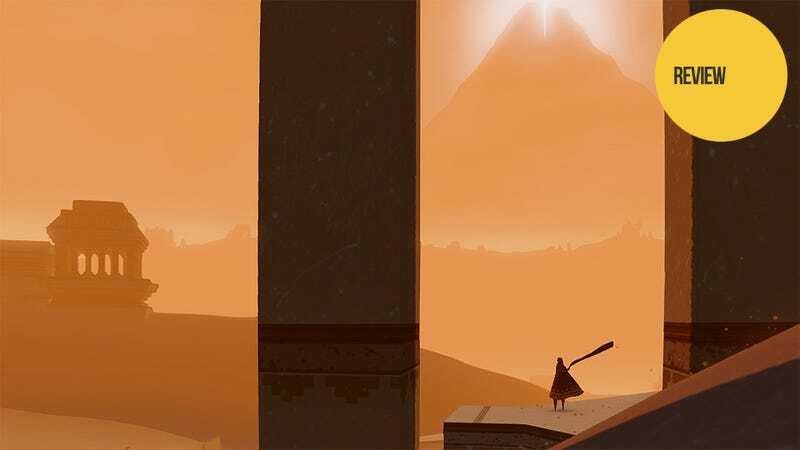 In Journey, players assume the mantle of a silent desert wanderer. This faceless, robe-clad nomad looks more or less like a ballet-dancing cousin of the Star Wars Jawa. As the game begins, the wanderer climbs a giant sand dune in the middle of a lonely desert. In the distance beyond the dune's crest towers a mountain. As the mountain comes into view, a title screen appears: "Journey." Until the credits roll, this is the only piece of text in the entire game. It wasn't chosen by accident. That one word presents a clear imperative: Your journey leads to that mountain. Go. WHY: Journey is a gorgeous, meditative game that combines disciplined design, cutting-edge technology and beautiful art into something remarkable and moving. Type of game: Holistically designed, text- and dialogue-free adventure game with a scattering of simple puzzles and a focus on experience over challenge. What I played: Played through the entire game twice, each time in a single two-hour sitting. Playing it for the first time and seeing how truly beautiful it is. Playing it for the second time and realizing how truly good it is. Trying to avoid using overwrought language when writing about it, failing. Nothing else, really. That's not to say it's some big flawless perfect whatever, but Journey is what it is with supreme poise and confidence. What flaws it may have are not of the bullet-point variety. "You won't want to stop believin'!" "You can play this game any way you want it!" "I'll be faithfully playing it again and again!" And so you do go, forward through blinding sun and murky darkness, through sunken, abandoned desert cities, through sandstorms masking ghostly, still-operating machinery from a bygone age. Through palaces and temples, places exotic and mysterious. Always forwards, and up; always towards the mountain. The game's controls are simple—use the stick to move forward. One button to sing, another to float. The rest of Journey's systems (and it does have systems) reveal themselves over time, and those revelations are part of the experience. It took me a while to understand how I was able to do some of the things I was able to do, and that road to understanding was a small journey unto itself. Do you need me to tell you how visually gorgeous this game is? I can try, anyway. Journey is an astonishing synthesis of technology, animation and art that brings a world to life in a way I've never before experienced in a video game. I could write yards about the sand alone—this sand is more than sand, it is an entity, flowing, shimmering, sighing with life. Sometimes the wind ripples through it like water; other times it billows like snow. Sometimes, the wanderer will surf down a sand dune like the world's most graceful snowboarder. Moments of jaw-dropping, eye-moistening beauty come on fast and then melt away. One early section in particular is less a game than a tiny symphony, a cascading build to a climax of searing visual splendor. Austin Wintory's musical score, punctuated by Tina Guo's lovely solo cello work, combines with the vast horizon and flowing scenery to conjure a space that is mournful, beautiful, playful, and sad. Over the course of the journey, the wanderer slowly knits a scarf. It grows longer and longer, and with it comes the power of flight. At its longest, it is a flowing banner, a symbol of proud accomplishment, and a vital tool for progression. Rarely have I encountered a purer vessel for metaphor than that scarf. But for all of the lofty things that can (and will) be said about it, Journey is a remarkably unpretentious game. I've already joked with some friends about how this game, like Limbo and ThatGameCompany's own Flower before it, will bring out the lyrical, self-indulgent side of many a game critic. (It's not lost on me that I opened this review with a story about knitting a scarf.) But more than its predecessor Flower, Journey is a game that knows exactly what it wants to be, and it is methodical and minimalist in how it achieves that goal. It says it right there in the title, after all: "Journey." In fact, it's the journey, a stripped-down version of the classic hero's journey, also known as the monomyth. Many tales, from Beowulf to Star Wars, have followed this template. Journey presents a particularly minimalist version of it, and as a result feels universal in a way that few stories do. Journey's pacing is impeccable. You'll never repeat an area or challenge, and not a single moment of the game feels wasted. In fact, you'll blow through each bit so quickly that it won't be until later, looking back, that you'll realize how far you've come. There are a few of what could loosely be called "puzzles" dotting the game—a Zelda mechanism here, a Chrono Trigger wind-puzzle there—but by and large, Journey requires only that players, well, take the journey. It leaves itself open to interpretation not by chance but by design—this game can be a metaphor for nearly anything, yet it feels entirely distinctive. It's a delicate and admirable balancing act. The embedded, organic multiplayer component adds another wrinkle to the experience, but it does so gently. At times, other players may wander into your game; you can't see their name or learn much of anything about them. They appear as another wanderer, and can help you along your way. It's all purposefully shrouded in mystery, much like the game itself—this is one of the first video games to allow people to connect online in a way that is entirely in harmony with its single-player philosophy. I've only played alongside one other player, but it seems safe to say that the multiplayer will be one more thing that makes Journey a game to re-experience again and again. I sense that once some of the game's initial magic has cooled, its multiplayer will reveal further layers of meaning to those who seek it. Journey represents an impressive evolutionary step in the holistic game design work of Jenova Chen, Kellee Santiago, and the rest of the small team at ThatGameCompany. As Flower was to the less fully-realized Flow, so Journey is to Flower. In fact, Journey is so focused that it makes the already-trim Flower feel padded and almost clumsy by comparison. I've played Journey all the way through twice as of this writing (it took me around 2 hours to complete each time), and I anticipate I'll play it many more times over the coming months. It wasn't until my second time through that I really felt as though I understood what the game was saying to me. In a later part of the game, I found myself both exhausted and tested. What must the wanderer be going through right now, I wondered? Such pain, such hardship. At that moment, I thought back to the joyful beauty I had witnessed merely an hour ago—leaping through the sand, warm sun on my shoulders, the energy and freedom of youth urging me to jump higher, higher! And now here I was, head down, teeth gritted, pushing through the cold, bitter trials of adulthood. Those lost moments of grace felt fleeting even as they were happening, and they felt all the more fleeting in retrospect. But there was no way to get them back; nothing for it but to push onward. And so I did, and so you will too. And round and round we'll go.